Q - And, then what did the man say when he saw 10 Easter bunnies hopping down a hill wearing sunglasses? A - Nothing...He didn't recognize them. Q - How does the Easter bunny paint all the Easter eggs? A - She hires santa's elves during off-season. Q - How do you make a bunny rabbit stew? A - Make it wait for an hour. Q - What does the Easter bunny say on Easter? Don't cry the Easter bunny will be back. 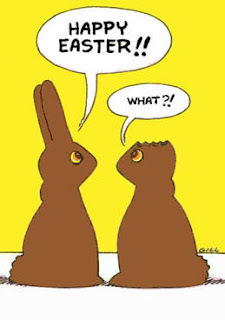 Q - What do Easter bunnies do to stay in shape? Q - What is a self-centered Easter bunny? Q - How did the Easter bunny dry himself off? A - With a hare dryer. Q - Did you hear the one about the 50 pound jelly bean? A - It's hard to swallow. Q - How do you send a letter to the Easter bunny? A - Try hare mail! Q - Who is the Easter bunny's favorite actor? A priest has been reassigned to a new church and wants to see how seriously the attendees take Easter. He approaches a one person and asks the meaning of Easter. She replies that Easter is when a giant bunny brings candy for children. Ok, how about another, so the priest asks someone else. He says Easter is when all the children color eggs, and the adults hide the Easter eggs and let the children participate in an egg hunt. Ok, how about another, so the priest finds a conservative looking person praying quietly, and he hopes she appreciates the meaning of Easter. She describes how Jesus carried the cross and then was crucified, and then his body was put in a cave with a rock at the entrance. Good so far thought the priest but then, Easter Sunday, the boulder magically rolled away from the cave, Jesus was resurrected ... and stepped out of the cave and saw his shadow, and he knew there would be 6 more weeks of winter.